Many cross-country road trips pass through Indiana; because of the state's location just south of the roadblock posed by Lake Michigan and the other Great Lakes, travelers from northern states find themselves shunted southward into Indiana's extensive transportation network. The state's northern corridor of road and railways near Chicago is the most heavily trafficked in the nation. 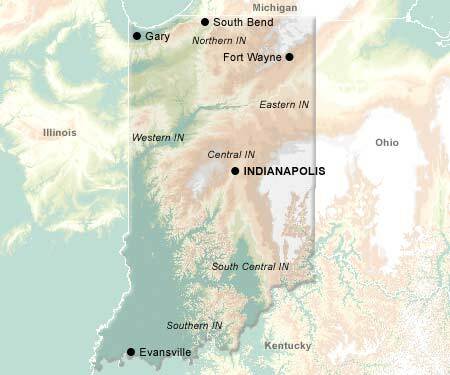 All this activity has earned Indiana one of its two nicknames: "The Crossroads of America". For all the crowds who pass through, though, only a small fraction stop to enjoy the sights. The view from the highway is often flat and undramatic, but that can be misleading. For example, just east of the industrial city of Gary, and a few miles north of Interstate 80, lie the beaches, sand dunes, bogs, wetlands, and woodlands of Indiana Dunes National Lakeshore. Near the center of the state lies Indianapolis, Indiana's only major urban center. A sports-mad city, Indianapolis is best known as the location of the nation's premier formula one auto race, the Indianapolis 500, which takes place every year on Memorial Day. Indianapolis is also known for its residents' intense loyalty to their pro basketball team, the Indiana Pacers, and their pro football team, the Indianapolis Colts. But in this city which advertises itself as the "Amateur Sports Capital of the World", as in the rest of the state, the greatest adulation is reserved for the Hoosiers. No one is certain where the word "Hoosier" comes from. Sometime during the mid-19th century, it came to represent anyone from Indiana - hence, the other common nickname for Indiana: "The Hoosier State". Nowadays, "Hoosier" is the name of the University of Indiana sports teams, as well as for many public and private high school teams. Cheering on Hoosiers is Indiana's favorite pastime.